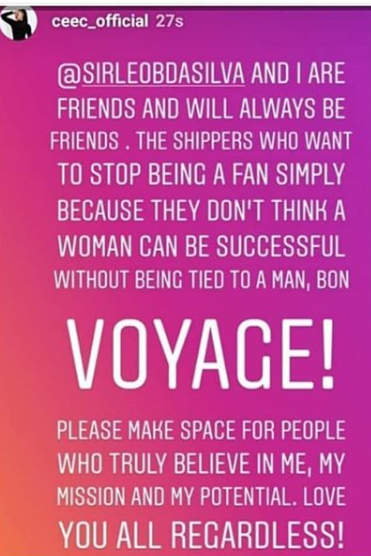 Big brother naija ex housemate and CEO of Cegar sport clothing, Cynthia Nwadiora, popularly known as Cee-C has issued a stern warning to all those fans who are only supporting her with the hope that she and fellow ex BBnaija housemate and Bestie, Leo Dasilva, would be romatically involved. She once again clarified the air, stating that she and Leo were just friends. Cee-C in her warning stated that she does not need to get involved with Leo to be successful and if those 'shippers' can't believe in her capability, her mission and potential, then they can make space for those who believe in her by leaving. Recall that Cee-C had stated that she is not in any relationship at the moment neither is she having an affair with Leo. ”I am single, No, I am not dating Leo. He is my best friend” she said. She went further to explain that she merely had a spiritual bonding with Leo, which was however perceived as a romantic affair by many of her fans and the general public.